Speed Reading Software Best Reader. About Best Reader speed reading software family. Best Reader is the english version of our speed reading software for improving reading technique and increasing reading comprehension. Schulte tables for field of sight widening - unlimited. Pentium 75MHz, RAM 16Mb, 10Mb of free disk space, SVGA. The virtual tutor called Assistant. The ability to change a font and its size according to your preferences. The ability to use Best Reader as a productivity tool for reading .TXT and .RTF files. a width of field of sight. A short free trial (about 1 day only). It is enough to see how your reading speed will grow. Best Reader is available now in downloadable form only. The retail boxes displayed on this page are virtual boxes and are not yet available. Best Reader ES is the spanish version of Best Reader. Visit home page of spanish version. Visite la página WEB de la versión español. 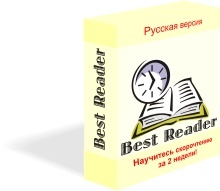 Best Reader RU is the russian version of Best Reader. Visit home page of russian version. Подробности на странице с русской версией. 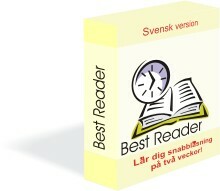 Best Reader SE is the swedish version of Best Reader. Visit home page of swedish version. Gе till hemsidan för den svenska versionen. Download Best Reader SE 6.1 [2 Mb] eller Buy now Swedish version. Ladda ner Best Reader SE 6.1 [2 Mb] eller Köp Nu den Svenska versionen. To improve your memory use KGB'secrets™, the most effective memory training game!